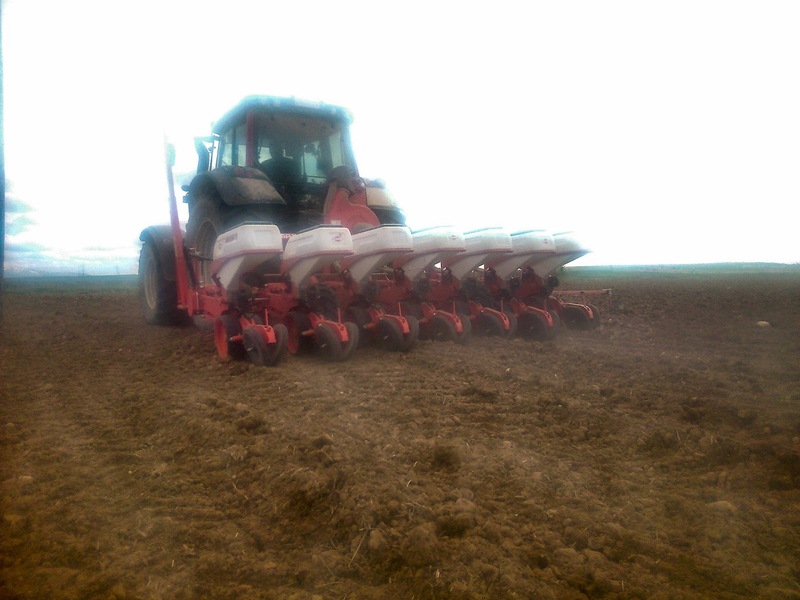 Our good friends and followers: Alberto Barrio and the twin brothers Cesar and Raúl Escribano sent us some pictures about their sowing sunflowers tasks in Turégano (Segovia)... thank you very much... the pictures are really nice. 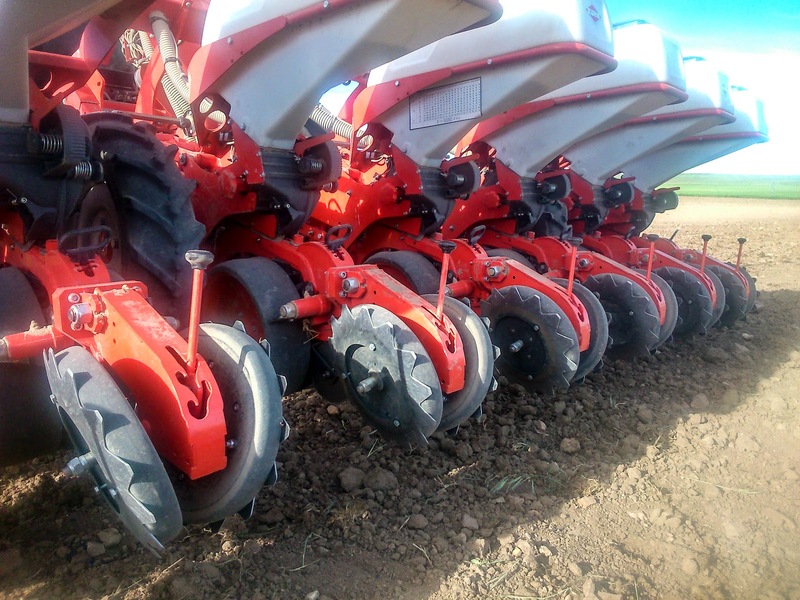 Alberto told us that during the last campaign he sowed about 300ha with his Kuhn Maxima 2TS pneumatic seed drill. 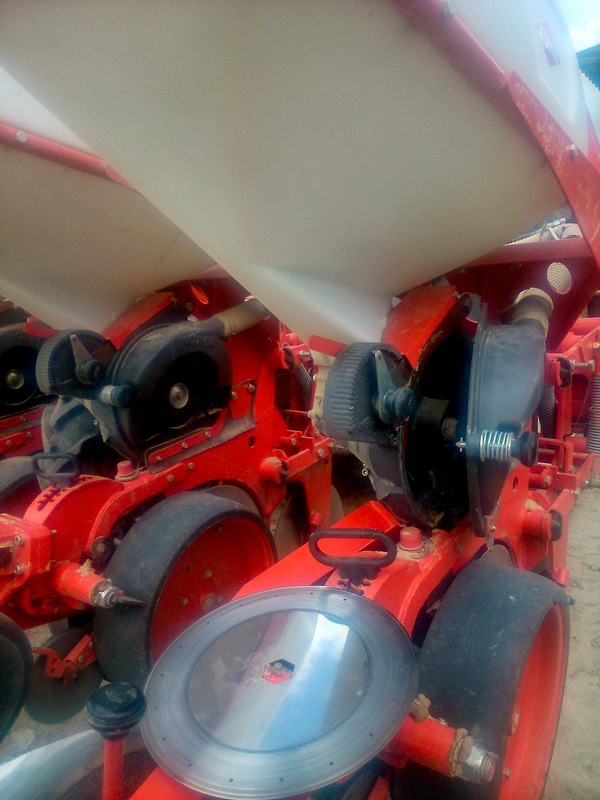 It is a seed drill of 7 rows and it has an air turbine that works at 540 r.p.m. (minimum at 470 r.p.m.). 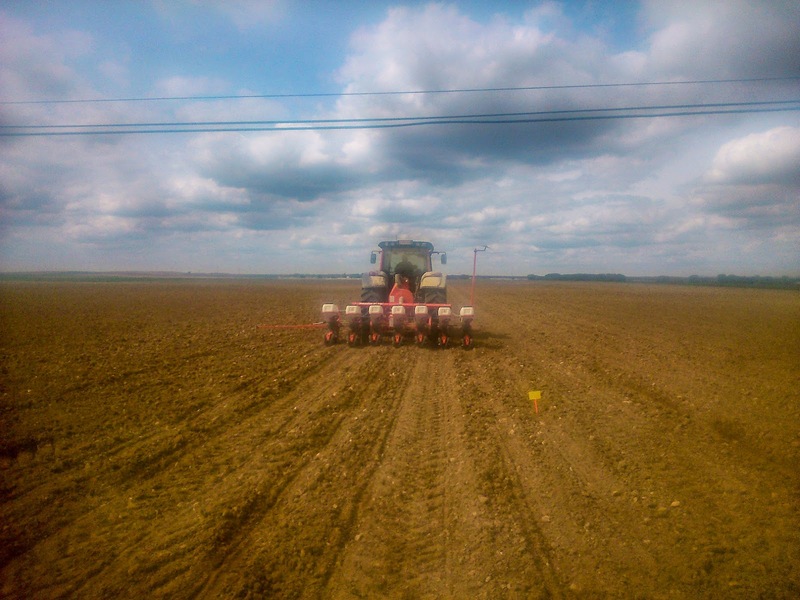 The distance between rows is of 60cm so the working width is of 4.2m. 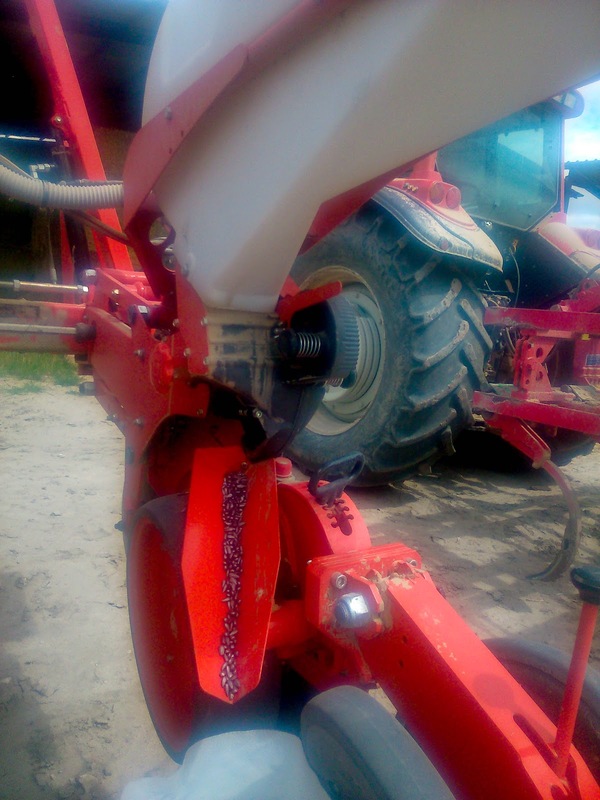 As it is a telescopic seed drill, the width for its transport is of 3m (the two last bottles can be folded). 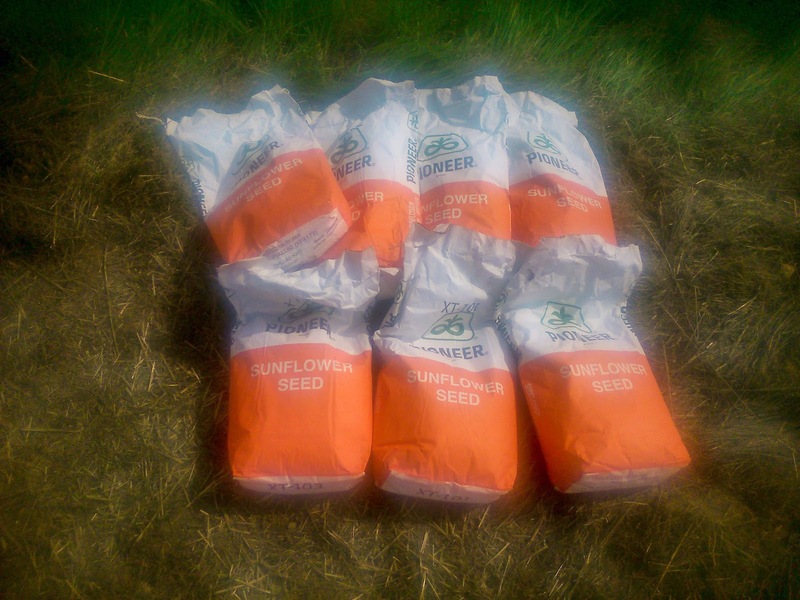 The used dose is of 51,000 seed/ha using a disc of 18 holes of 2.5mm each. 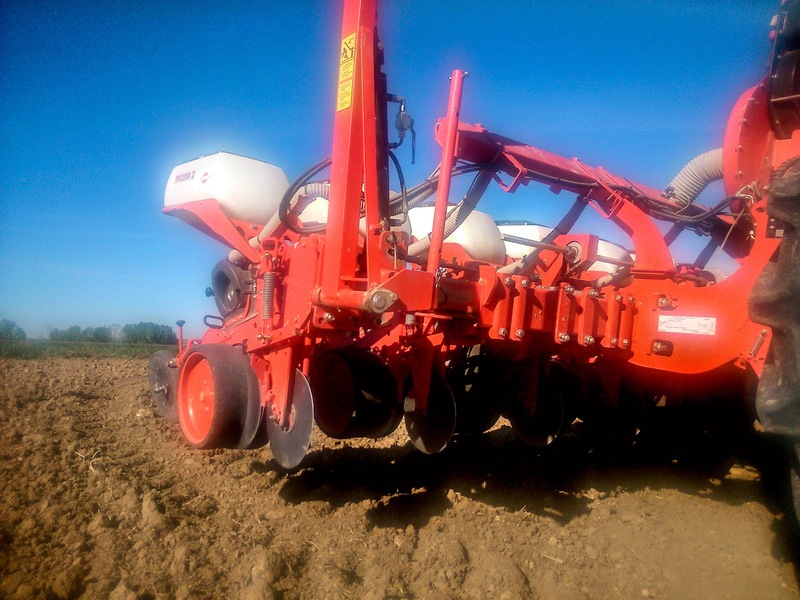 We phoned him yesterday and he said that he is very happy with this seed drill because he has worked for three years and he has never had any problem. The computer warms him if the machinery has any trouble e.g., any bottle can't throw seeds, alrhough this has only occurred once. 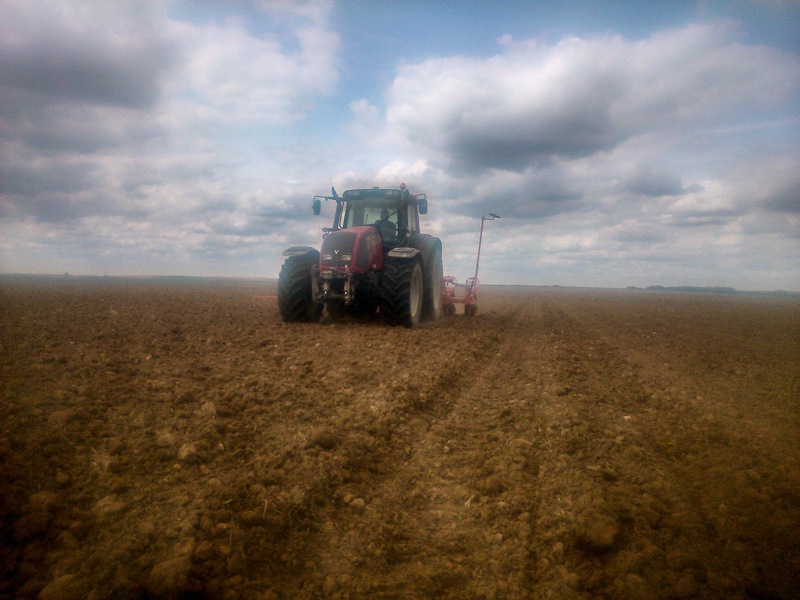 By the way, the working speed can depend on the soil but it is normally about 6.5 km/h. 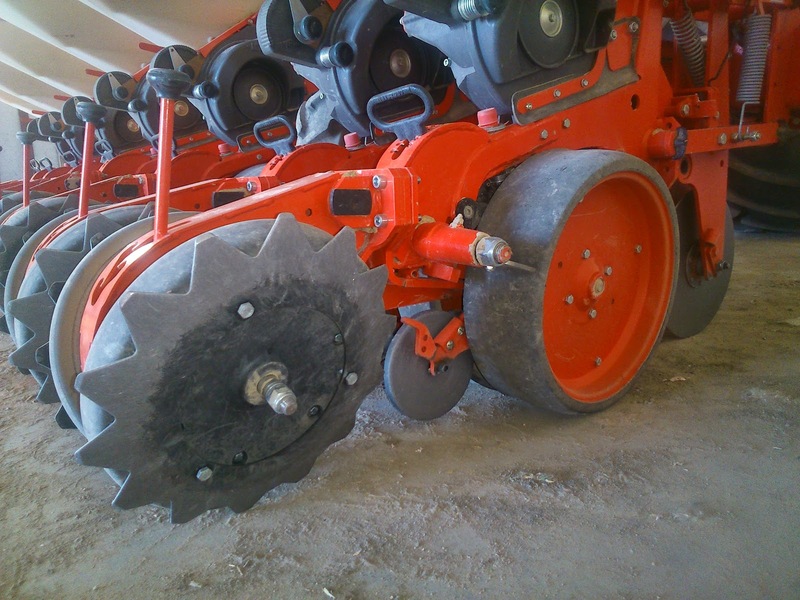 He had a unit problem wearing out of rear inclined wheels, which waa solved with cog dishes (they were bought in Argentina) as you can see in some pictures. 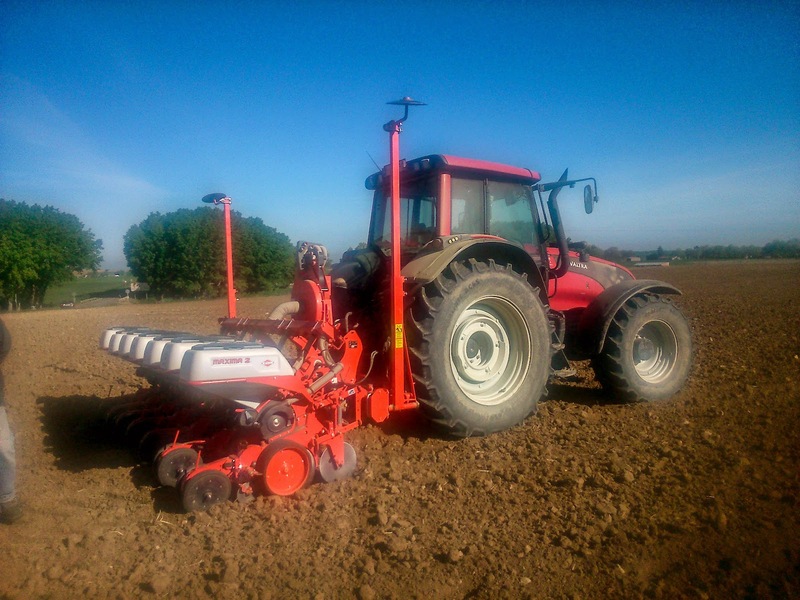 Cesar and Raúl are using a Monosem seed drill as you can see in the video they sent us. 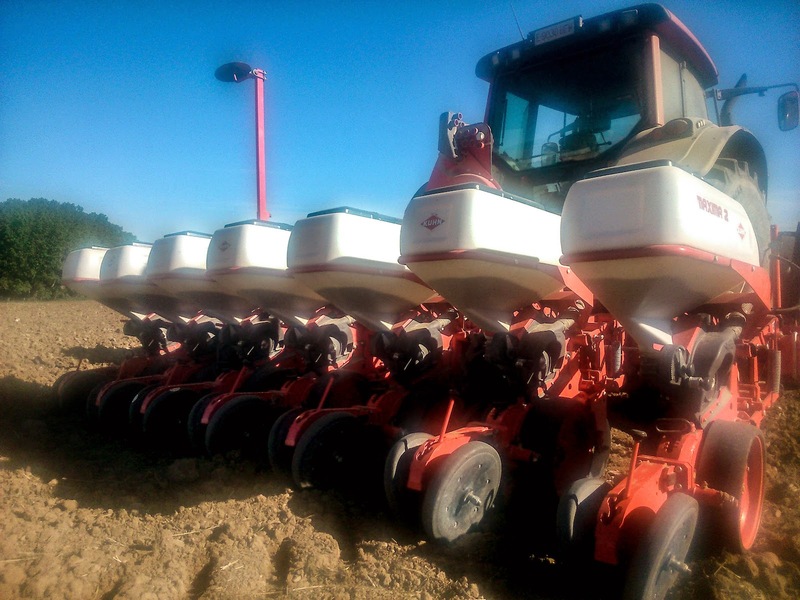 We would like to highlight they Trimble EZ-Pilot assisted steering system with CFX-750. They use the RangerPoint RTX signal (it is a suscription signal which offers them a maximum error of 15cm) and it allows them to work even without driver :)... we will show you our assisted steering system when it will be installed. Estoy deseando ver el vídeo de vuestro autoguiado funcionando. 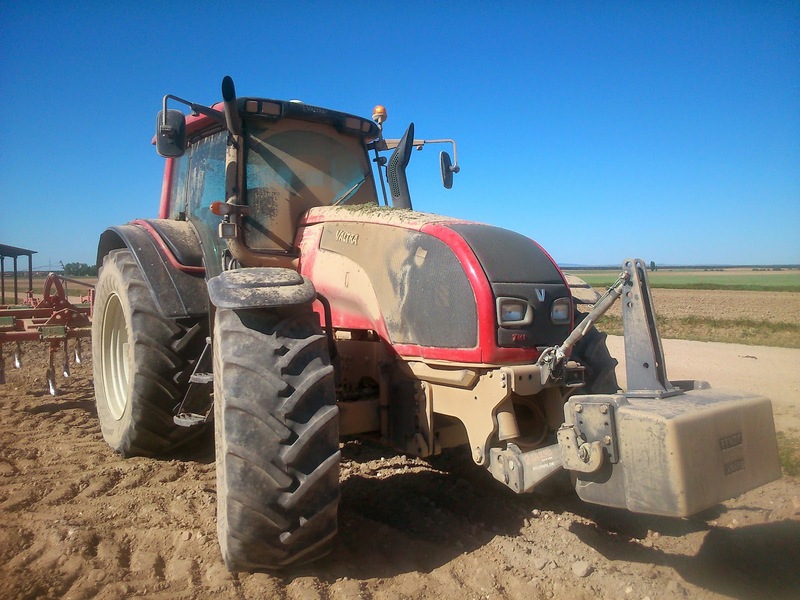 Esas ruedas pisadoras o tapadoras tienen un problema cuando trabajan en terreno con mucha piedra o mucho terrón, que han solucionado al poner los platos estrellados. Al tener poco diámetro, cuando pillan un terrón duro o una piedra, el plato no gira y arrastra hasta que se quita la piedra, problema típico en las monosem y otras marcas, por lo menos en mi zona que tenemos muchísima piedra. 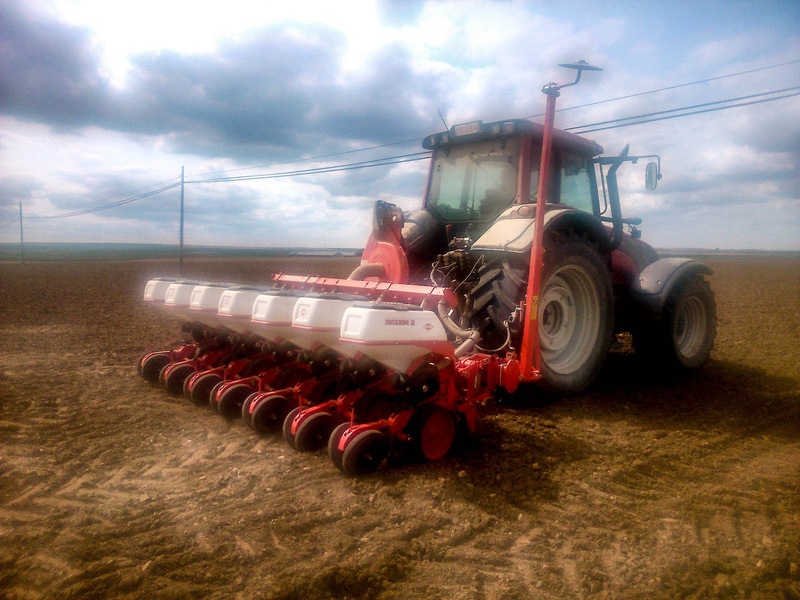 Ahora, si el terreno está perfecto preparado, no hay terrones o has pasado delante el rotavator queda perfecto. Kiko, muchas gracias por tu comentario. Pues aún no lo hemos hecho porque no hemos podido trabajar con él... está todo hecho por ahora. Respecto al desgaste de las ruedas, tienes toda la razón. Otro motivo es por la inclinación con la que trabajan.